While most people think of reality TV when they hear the word “survivor,” a real survivor is someone who can live off the land in an emergency. This is a challenging and sometimes scary task. Those of us who weren’t in the boy scouts may not know where to begin if stranded in the forest. Did you know that humans can survive for weeks without food, but only days without water? The right type of shelter will prevent you from losing too much body heat and can mean the difference between life and death. Even something as simple as thick fog can lead to hypothermia. Preparation is vital. Make sure to dress in layers. When you’re going camping, pack a rope/cord and a waterproof, windproof material (like a tarp or Mylar blanket) that you can use to insulate yourself or as an emergency tent. Always research the terrain and weather patterns before you leave. Making camp: if you find that you need to construct a shelter, pick the driest spot available. High ground is best if you’re looking for other people or camping in a hot climate. Amongst trees is best if camping in the cold – but don’t build your fort in a valley or you’ll be trapped in a pocket of cold air at night. If camping in cold weather, a single tarp won’t be enough to insulate you from the elements. The easiest way to make a shelter is beneath a fallen tree. If you happen to find one, gather branches and pile them up against the windward side. Pile debris against the branches until no light peaks through. 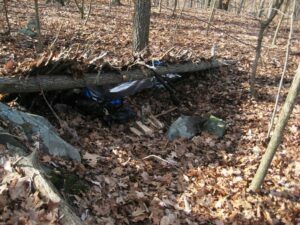 If you can’t find a fallen tree, you can build a lean-to against a large rock or small overhang. If the previous option isn’t available, you can construct an A-frame shelter. This one isn’t as sturdy and is harder to make. Begin by using branches (10-12 feet long) to construct the frame of an A-shaped tent with one end open and the other end on the ground. Pile dry debris against the frame. Remember, your shelter should be just big enough for you to sleep in. The smaller the space, the warmer it will be.